Becky Catchpowle from Havant has been told she is breaking planning laws by Havant Borough Council and could face a £5,000 fine. Hampshire Police are issuing advice to parents after a man was assaulted by a group of teenagers in Havant Park. Three men from Havant have been arrested on suspicion of committing sexual offences against teenage girls. Hampshire Police says it received a report of sexual offences occurring in Leigh Park between Monday 22nd May and the early hours of Tuesday 23rd May. Officers are conducting investigations at an address in Park Parade to establish the exact circumstances of the incident. They are keen to speak to anyone who was in the Park Parade area on Monday evening. The three men - aged 20, 36, and 43 - remain in custody. Anyone with information should contact DI Adam Price at Fratton Police Station on 101 quoting Operation Tent (44170193422). A man has been arrested after this dramatic accident in Havant early this morning. 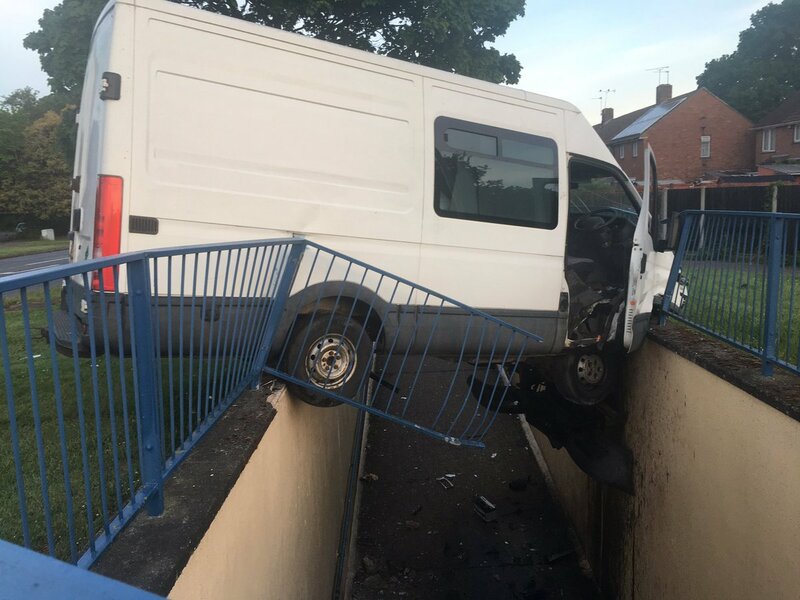 Hampshire Police Roads Policing Unit tweeted the pictures at 6.24 am, showing a white van suspended over a walkway in Petersfield Road at its junction with Stockheath Road. Thankfully there were no reports of any injuries but the driver has been arrested. Police in Havant have begun a month-long crackdown on motorcycle related anti-social behaviour. There have been 43 reports since August 2016 of mopeds, motorbikes, mini motos and GoPeds causing a nuisance in the Dunsbury Hill Farm area, south of the A3. A further 15 incidents of theft of a motorbike and three suspicious vehicles have been reported, to the Barncroft and Bedhampton Neighbourhood Policing Team, in the last six months. Officers will increase patrols in the area as a result. There are delays of up to 20 minutes on South West Trains between Havant and Guildford due to an earlier signalling problem. Engineers have worked through the night to identify the issues, however some of morning services are being affected in the Haslemere area this morning. Trains may be diverted via Eastleigh. The Conservatives have retained overall control of Havant, with Labour down two and UKIP plus two. One person has been rescued from a fire at a block of flats in Havant tonight. Crews from Havant and Cosham were called to the scene in Chidham Walk. Two other people escaped from the blaze. The fire broke out in the kitchen area and the cause is being investigated. One person was treated at the scene for smoke inhalation. An investigation's underway following a report of an attempted sexual assault in Havant. Police have now released an E-Fit image of a man they would like to speak to in connection with their enquiries. A 33 year-old woman who was travelling back from London on a train on Thursday 21st January, arrived at Havant Station at 23:15pm. She then walked to where she had parked her car on Crosslands Drive. As the victim crossed River Way using a footpath from Lavant Drive she became aware of someone walking behind her. She reported that a man she did not know grabbed her and pulled her to the ground. He tried to sexually assault her, but she fought him off and he ran off towards Lavant Drive. The victim was not injured during the incident. He was wearing white 'Converse' style trainers. The man had his face covered and was wearing a light coloured hooded top. "We have been patrolling the area over the last week and speaking to local residents as part of our investigation. Enquiries are ongoing as we are continuing to review CCTV footage from the area. "I'm still keen to hear from anyone who was on the same train as the victim and who got off at Havant. They may have seen the man believed to have been involved in the area. Maybe this new E-Fit image will jog your memory. Were you on a late train arriving at Havant this time last week? "We have not received any similar reports in Havant in recent weeks. Havant is a very safe place in which to live and work, but I'd like to remind people to observe general common sense advice such as walking through well lit areas, where possible, at night". Police are investigating an attempted sexual assault in Havant last night. A 33 year-old woman who was travelling back from London on a train arrived at Havant Station at 11:15pm. She then walked to where she had parked her car on Crosslands Drive. As the victim crossed River Way using a footpath from Lavant Drive she became aware of someone walking behind her. She reported that a man she did not know grabbed her and pulled her into nearby bushes. He tried to sexually assault her, but she fought him off and he ran off towards Lavant Drive. The victim was not injured during the incident. The man had his face covered. "We are carrying out forensic enquiries in the Crosslands Drive area this morning as part of our investigation. I'm especially keen to hear from anyone who was on the same train as the victim and who got off at Havant. They may have seen the man believed to have been involved in the area. "We have not received any similar reports in Havant and I'm not linking this report to any other investigations at the current time. Havant is a very safe place in which to live and work, but I'd like to remind people to observe general common sense advice such as walking through well lit areas, where possible, at night. "We will be patrolling this area of Havant over the next few days in order to speak to local residents and answer any questions they may have".